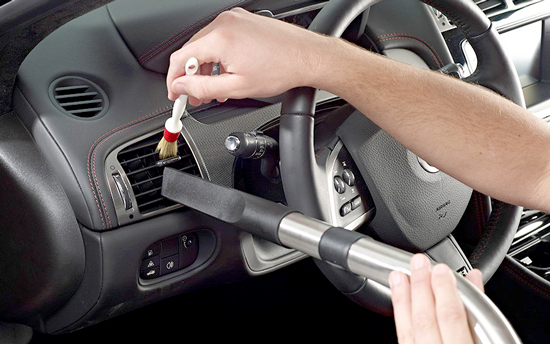 Most people want to keep their car clean, but they don’t have the time or energy to do it. So, if you’re stressed, and pressed, for time, here’s what you can do in one short weekend. Wash your car. This isn’t something most people have time for. But it’s not that difficult. Go down to your local autoparts store and pick up some car washing soap. This soap is different from the detergent you use to wash your dishes. Dish detergent will strip wax off of your vehicle’s clear coat. So, if you use dish soap, be prepared to wax your vehicle. Car soap is gentle enough to wash your vehicle without stripping the wax and other protective coatings off the vehicle. If this sounds like too much trouble, take it to a professional detailer and have it cleaned. It will be the best $50 you’ve ever spent on your vehicle. These car seat covers will make your car look almost brand new. Seat covers protect the upholstery from dirt and debris, and they can be removed and washed when needed. This is a lot easier than trying to wash your seats in the car, especially if you accidentally spill something on them. Seat covers are perfect for people who eat in the car or have friends or relatives who do. They’re also inexpensive. Most of them slip right over the seat, while some of them have tiebacks to help secure them to the seat. One way to reduce the amount of cleaning needed is to not eat in your car. Food creates an awful mess. Ketchup, mustard, oils, and grease - these things stain, and they’re difficult to get out of upholstery. They can also stink up the vehicle and make it feel like truly used, and abused, car. Make a rule for yourself and guests: No eating in your vehicle. That’s tough these days, what with cupholders being so common. But, if you stay committed to it, you can keep your vehicle clean just by keeping food and debris out of it. By putting your vehicle in a garage, you protect it from the elements. Rain, snow, and consequently mud and dust, won’t get to your vehicle nearly as quickly as if it were left outside. garages also shield the vehicle from sun, which can cause your paint to fade, and it can ruin your clearcoat. Garaging your vehicle can get expensive though. In fact, unless you own the garage, it’s one of the most expensive ways to protect your vehicle. Still, many people pay for parking or covered garage space to protect their vehicles because they believe it’s worth it. If you can’t afford, or don’t want to pay for, garage space, consider a car cover. It’s much cheaper and will provide decent protection for your vehicle. If you do eat in your vehicle, or if you keep napkins, tissues, or anything else that’s disposable, in your car, a trash bag helps to keep all garbage in one place. Just make sure you empty the trash periodically. Cinthia Black controls a domestic cleaning department and likes to share her ideas and insights with an online audience. She has also guested for a variety of relevant websites.